JCB Agriculture is celebrating a major milestone in its long record of innovative machine design and engineering – the 40th anniversary of the Loadall telescopic handler. First manufactured in 1977 to transform lifting and loading tasks on building sites, the potential for the Loadall to revolutionise materials handling tasks on farms was soon recognised. With its ability to reach forwards and upwards way beyond the capabilities of tractor-mounted loaders and rough-terrain forklifts, the JCB Loadall brought new levels of efficiency and productivity to livestock and arable farms alike. So much so, that it helped spark a materials handling revolution, with input commodities such as seed and fertiliser, and farm outputs such as hay, straw and silage, packaged in larger quantities thanks to the outstanding lift capacity and load placement capabilities of the new machines. Today, the Loadall telescopic handler has become such an indispensable tool on many farms that it invariably works longer hours than any tractor. On livestock farms, regular chores include filling a diet feeder twice a day with silage and other rations, loading bales on to trailers at harvest, placing straw bedding into cattle and pig yards, and filling the manure spreader when it comes time to clean them out. On arable units, supplying the drill with seed and fertiliser from bulk banks or the potato planter from tipping boxes are routine tasks for a Loadall telescopic handler, along with loading bale trailers and hauling them back to the store, pushing up grain to make the most of storage capacity, and out-loading crops into haulage lorries when they are sold. To meet this varied workload, JCB’s Loadall factory produces around 50 individual models and distinct variants for agriculture and horticulture alone, alongside many more for construction and industrial use. They range from the diminutive 50hp Loadall 516-40 with its 1600kg lift capacity and 4.05 metres lift height to the 145hp Loadall 560-80 capable of lifting 6000kg off the ground for high output repeat loading cycles of bulk materials, and the 9.5 metre lift 535-95 for when big straw and hay bales must be stacked high. Between those performance extremes come Loadall handlers designed and engineered to meet specific end-user needs and priorities – efficient handling and loading with the ultimate in economy from the new Smart Power versions of the Loadall 536-60, 531-70, 536-70, 541-70 and 535-95. A choice of performance, cab equipment and control features from the Agri, Agri Plus and Agri Super versions of the core Loadall range from the 525-60 to the high-lifting 535-95; special features to cope with the particular needs of poultry farmers and contractors with the PoultryMaster versions of the 527-58. And, of course, there is ultimate in telescopic handler power transmission technology in the newly-expanded Loadall Agri Pro line-up featuring the unique DualTech VT hydrostatic-plus-powershift drive system, available on the 531-70, 536-60, 536-70, 541-70, 535-95 and newly released on the 560-80. Technology developments that add performance or ease of use – such as the Smart Hydraulics features that enable Loadall handlers to work faster and more effectively – have always underpinned development of the Loadall line and sustained the accolade it achieved 10 years ago as the World’s Number One telescopic handler. In line with development of the Loadall product itself, JCB has repeatedly invested in the Loadall manufacturing and assembly facilities at Rocester, notably in 2007 when an £8 million project brought new machining centres, heavy-weight steel presses for boom manufacture and additional robot welding stations to produce the complex chassis structure. The upgrades, which also saw all-new, higher capacity assembly lines installed, coincided with a significant milestone – production of 100,000 handlers since the first Loadall 520 came off the line in October 1977. The accelerating pace of Loadall sales meant that in 2016 – less than 10 years later – the 200,000 milestone was reached as the advanced Agri Pro was launched and the efficient materials handling opportunities that the Loadall represents continued to increase its appeal to farmers around the World. There are more than 30 base models and over 1,000 individual configurations. Each one takes around 35 stages to produce and 8 hours to assemble. Loadall manufacture consumes more than 35,000 tonnes of steel a year. 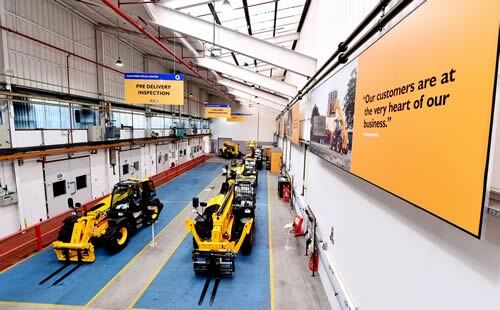 JCB divisions manufacture the engines, transmissions, axles, cabs and hydraulic cylinders. A recent £1 million investment brought new precision laser and plasma cutting equipment. A 650-tonne steel press forms the telescopic boom box sections. On average, it takes 45 minutes to make two sides of the heavy-duty chassis. Robots handle 70% of chassis welds – but skilled operators tackle hard to access welds. Welding during Loadall construction consumes 14,509,818 metres of wire a year. Preparing and painting booms, chassis and stabilisers (on construction models) takes two hours. The painting facility uses 73,000 litres of primer and 50,000 litres of gloss paint a year. Manufacturing components employs 300 people, assembly operations another 460. Assembly line staff are trained for at least three main functions so they can switch around. Complex handlers are allocated more people so production time is equal for every machine. Every Loadall spends 13 minutes at full speed in a roller test booth to calibrate the driveline. Every Loadall must hold a test weight with the boom fully raised and extended for 10 minutes. Thorough Pre-Delivery Inspection checks are followed by final checks, finishes and valeting in the Customer Focus Centre, and registration on JCB’s LiveLink telematics system.